This week, dearest Filthy Dreams readers, a star was born. No, I’m not talking about that film with Lady Gaga and Bradley Cooper (hard pass–you’re no Judy or Babs!). Nor am I talking about the new members of Congress that turned the House blue and freaked out Trump so much he was in a near-constant spitting rage throughout the following days. I’m clearly speaking of the as-of-now nameless White House intern, who, despite remaining anonymous, certainly blasted through our screens on Wednesday during the President’s press conference like an angry and determined beacon of light, a burgundy Anthropologie dress-wearing asteroid, or a presidential approval-seeking missile. As you can tell, it was love at first sight as I watched her, at Trump’s somewhat unspoken insistence, aggressively stomp up to seasoned and now embattled CNN reporter Jim Acosta to attempt to yank the microphone from his hands. 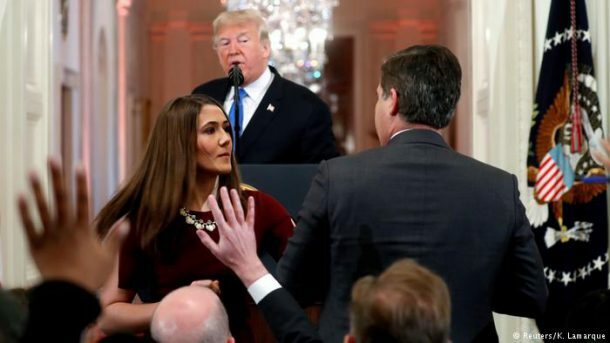 Acosta’s transgression? Doing his job by asking about the migrant caravan (the horror! ), leading Trump to slur, “That’s enufffffff. That’s enufffff” as this intern had her moment in the spotlight. Of course, surviving almost two years through the Trump administration, we all know that Trump stars tend to burn bright and flame out like Icarus flying too close to that grifter sun or like a moth caught in a tanning bed. Remember Sam Nunberg’s multi-news channel bender? Yeah, I barely did either, though he earned himself his own Filthy Dreams tribute. However, some people you can just feel have what it takes, that certain “it” factor that is hard to put into words. And boy, does this starlet intern have it. Move over, Kellyanne, there’s a new woman in town! Even Trump’s finger-wagging and all-too-ironic accusations that Acosta is “rude” and a “disgrace” paled in comparison to her. I mean, just a few tugs of the microphone and this intern cost poor Jim Acosta his White House press pass and encouraged the White House to spread some lame InfoWars fake news. And hey, while we’re on the subject, if there’s an extra press pass floating around, why not give it to Filthy Dreams! I swear, I’ll let this girl have the mic if she wants it! Or we can turn it into a full WWE-style Wrestlemania showdown. From the looks of it, this prim and proper-seeming White House intern certainly would make quite a worthy and probably terrifying opponent. Now, what was it about this intern that captured my heart? Was it her dogged energy as she locked eyes with the microphone that was to be hers? 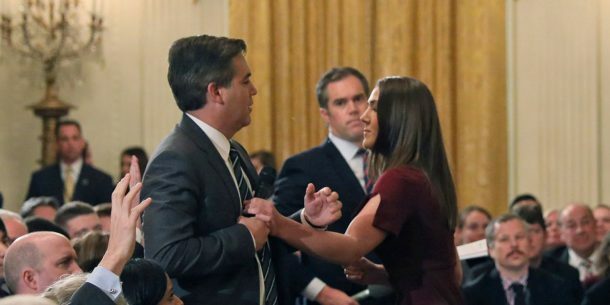 How she snuck out of apparently nowhere to tussle with Acosta? Her lack of fear in confronting a well-regarded journalist, while still maintaining her well-coiffed style? Was it her huffy and approval-seeking glance she kept shooting the President, hoping to make a splash with the ratings machine, becoming the next Hope Hicks (who she resembles anyway)? Or her eye-rolling “can you believe this” attitude that came shortly after? Was it her somewhat threatening air like she would have ripped off her Bloomingdales necklace and thrown down at a moment’s notice? Perhaps all of the above. All I know is I was convinced that we could use some of her can-do energy around here at Filthy Dreams and hey, we can offer to pay as much as Trump realistically will, which is nothing. It all made me ask: Who is she?! And days later, who knows! I’ve been waiting and waiting for days on end for an in-depth profile about this particular up-and-coming lady White House intern. What do journalists even DO anyway? It’s as if suddenly political reporters want to protect young underpaid 20-somethings. I seem to remember a specific intern’s life that was ruined in the late 1990s and permanently connected for the rest of her days with cigars and stained dresses. Let’s not act as if we’ve somehow evolved. If anything, we live in a more exploitative culture. So let’s go for it. I’m not saying this intern’s life has to be upended, but I’d like a name so I can laugh at her posts on various social media platforms. Because of her anonymity, I assume she’s connected to some high level Republican donor or even media figure, but I don’t care–I demand details so I can write her gushing and impressed letters. Get it girl! And don’t think I haven’t done my own research–Googling, searching on Twitter, squinting at photos of the 2018 White House intern photos. I’ve tried EVERYTHING! Tags: anonymous, Anthropologie trash aesthetics, Bad Girls, Camp, disco, Donald Trump, Jim Acosta, mic-grabbing internships, Republicans, Trash, Tributes, White House intern, who is she. Bookmark the permalink.